On a foggy October morning, gray haze draped over Richmond’s skyline, providing an alluring landscape for aerial photographer Daryl Watkins. The rumbling of a distant train grabbed his attention as Watkins prepared to fly his drone from Great Shiplock Park in the city’s East End. Watkins is the man behind Creative Dog Media, a Richmond brand known for its striking aerial photographs of Virginia skylines and landmarks. Since he started as a hobbyist three years ago, his Instagram account has grown to more than 20,000 followers. 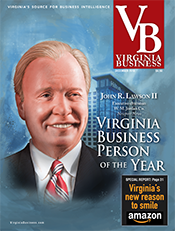 The social-media following led to commercial opportunities, with Watkins providing aerial photography for clients such as Virginia Tourism Corp., Richmond Region Tourism and Southern Living magazine. In fact, business has been so good that aerial photography has become a growing side business for Watkins, the co-owner of a technology firm. It also took a chunk of his revenue from those jobs. That all changed this summer. The FAA issued long-awaited regulations governing commercial drones — officially known as small unmanned aircraft systems or UAS — weighing less than 55 pounds. Known as Part 107, the rules allow commercial operators, who are at least 16 years of age, to obtain a remote pilot airman certificate to fly drones. To obtain a certificate, Watkins passed a required aeronautical test, which included questions on subjects ranging from visual sight charts to the definition of frost. He was so eager, in fact, that he took the exam the day after the rules came into effect. The new rules are expected to spur dramatic growth in the drone industry. In the six weeks after Part 107 came out, 8,975 people had taken the pilot certification test nationwide, and 88 percent had passed. 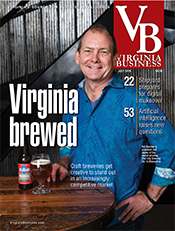 Virginia officials and a group of businesses interested in the use of unmanned systems say the commonwealth has the attributes to be a leader in this emerging technology — not only in drones but in driverless vehicles and unmanned maritime vehicles. 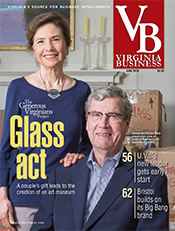 Virginia touts a diverse topography, a large military presence, proximity to Washington, D.C., and ongoing higher-education research on unmanned systems. To create a unified voice for users of unmanned systems in Virginia, industry representatives recently formed a trade association. The growth in unmanned systems represents nothing less than the next big revolution, says U.S. Sen. Mark Warner. “This is an area where with the right vision and the right execution, we can be the Silicon Valley of unmanned systems,” he says. The potential uses of unmanned systems seem endless. Today drones inspect power stations and buildings. They create detailed maps. Health systems are looking at using unmanned systems to move medications and other supplies around hospitals. Government agencies are exploring ways to use the technology for chasing storms and to aid in search and rescue missions. 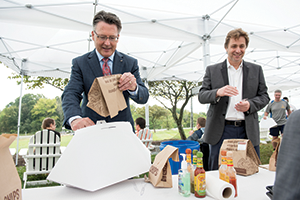 For everyday consumers, the industry could bring driverless cars and package delivery by drone. Unmanned aerial systems made a big leap this year with the introduction of the Part 107 rules, providing official guidelines for how companies can use drones. The new rules could have a major economic impact. A report by Goldman Sachs predicted that the Part 107 rules on drones could generate $82 billion for the U.S. economy and create more than 100,000 jobs in the next 10 years. The rules, however, still maintain a certain number of restrictions, including a drone weight limit of 55 pounds and a maximum flight height of 400 feet above ground. The rules also prohibit nighttime operations and flying over people not participating in the commercial activity. Companies may apply for waivers from these restrictions. The rules also require operators to keep their drones in their line of sight — a restriction that will limit the full-scale use of drones in the marketplace. For example, package delivery by drone wouldn’t be feasible. “There are still a substantial amount of regulations that basically still means there are some roadblocks to full commercial drone integration, but [Part 107] is definitely a major step forward,” says Windle. 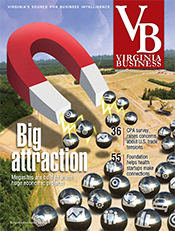 Virginia has become a key player in drone research. Much of the research today is focused on how these aerial systems could be flown safely if the FAA lifts these restrictions or changes its regulations. Dominion Virginia Power, for example, has received FAA approval to fly drones beyond line of site for some test scenarios. The power company conducted a test with Virginia Tech’s Mid-Atlantic Aviation Partnership in July and provided results to the FAA. The company is planning future tests. Dominion is using drones to inspect transmission lines and structures ranging from wooden utility poles to transmission towers that are 200 or even 500 feet high. Drones allow Dominion to make inspections from more angles than it could achieve with a helicopter. 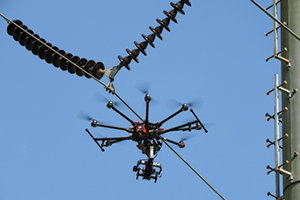 Using drones for inspections, however, costs about the same as using helicopters, according to Steve Eisenrauch, manager of electric transmission forestry and line services for Dominion Virginia Power. Helicopters can easily travel from tower to tower, while line-of-sight rules require employees to travel by car to inspection sites. Virginia scored a major coup when Virginia Tech’s Mid-Atlantic Aviation Partnership (MAAP) was picked as one of the FAA’s test sites for unmanned aerial systems. MAAP began operation in late 2014 and now flies more missions and tests for commercial drone uses than any of the FAA’s six other test sites. “We’ve flown about 2,300 flights in the past two years, and we’ve flown everything from a half- pound aircraft to aircraft that are nearly 10,000 pounds,” says Mark Blanks, director of MAAP. MAAP runs tests daily at locations all around Virginia, taking advantage of the commonwealth’s diverse topography. Other FAA test sites conduct the majority of their tests at one location. “We’ve worked with dozens and dozens of companies, and our purpose at this point in time is to help those people broaden their capabilities and test their systems in a way they couldn’t do anywhere else,” says Blanks. 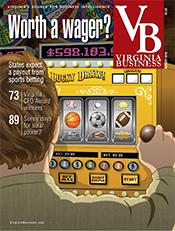 Virginia has several advantages in developing an unmanned systems industry. The commonwealth is close to the industry’s regulator, the FAA, and federal agencies studying potentials for their own use of drones. 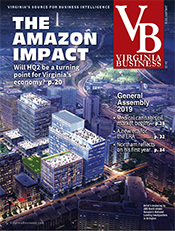 In addition, Virginia offers a diverse landscape providing a variety of testing locations, a large military presence and the newly established Automated Corridors in Northern Virginia to test driverless vehicles. In addition to MAAP’s drone research, the Virginia Tech Transportation Institute is a leader in research on driverless technology. Virginia Tech is home to the Virginia Center for Autonomous Systems, and unmanned systems research also is underway at the University of Virginia, Old Dominion University and George Mason University. 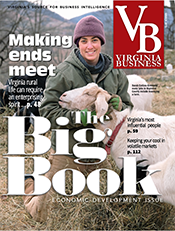 Virginia, in fact, has long been a producer of high-tech drones for the military. Many defense contractors here are now exploring potential commercial applications for their technologies. Raytheon Intelligence, Information and Services (RIIS), a Dulles-based business unit of Raytheon Co., has been involved in unmanned technologies since the early 1990s. The company provides unmanned systems support and training to the military in addition to manufacturing drones. Today one of its major programs is producing control systems for the Global Hawk, a high-altitude plane used for intelligence, surveillance and reconnassance. Unmanned underwater vehicles represent another potential growth area for Virginia, because of its heavy Navy presence and access to the Atlantic Ocean and James River. Newport News Shipbuilding (NNS), Virginia’s largest industrial employer, last year purchased an unmanned underwater vehicle company in Florida. “We see this market as a potential growth area in the future as the Navy looks more and more to unmanned, undersea vehicles and aerial vehicles,” says John Lamb, director for program integration and strategic readiness for NNS. The company leases Proteus, a 26-foot-long unmanned underwater vehicle, to Navy bases in Florida. 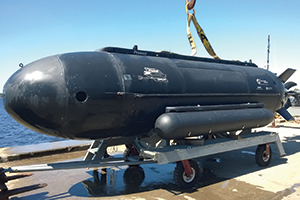 The Navy is testing unmanned vehicles for use in areas such as sea-floor mapping, surveying, and the launch and recovery of underwater systems. NNS has submitted a request for information application to the Navy to participate in the development of an extra-large unmanned underwater vehicle, XLUUV. In August 2015, Gov. 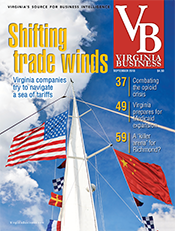 Terry McAuliffe created the Virginia Unmanned Systems Commission to make recommendations on how Virginia could become a national leader in unmanned systems, not only with drones, but also with unmanned cars and maritime systems. One of the key recommendations in the commission’s interim report was the need for a state group representing the rapidly growing industry. 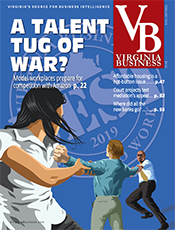 So the law firm Williams Mullen teamed up with McGuireWoods Consulting to help launch the Unmanned Systems Association of Virginia (USAV). Both firms have worked with clients who were using or are interested in using unmanned technology. 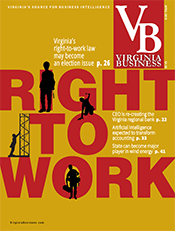 “Commission members noted there was a need for an organized voice to really advocate for the industry and for Virginia in terms of all unmanned systems,” says Michele Satterlund, senior vice president of state government relations at McGuireWoods, who will be one of the lobbyists working with the organization. Kevin Pomfret of Williams Mullen, who works with several clients using drones, will serve as the association’s interim director. The group’s founding members include a wide range of companies with operations in Virginia, such as SAIC, Raytheon, Volkswagen Group of America, Newport News Shipbuilding and Dominion. “Since we announced the association, we’ve had lots of inquiries from a wide variety of entities that are either already involved or interested in becoming involved in unmanned systems,” says Mark Hubbard, a senior vice president with McGuireWoods Consulting. As unmanned technologies grow, states are likely to play a larger role in creating regulations. Williams Mullen began its unmanned systems group 15 years ago as defense-sector clients began to look for commercial opportunities in unmanned technology, particularly aerial vehicles, which have created a host of legal questions. Unmanned systems raise questions about privacy, intellectual property, property rights and the ownership of data collected from unmanned systems. So far, Virginia has placed restrictions only on the use of drone technology by police, who must get search warrants to use drones. 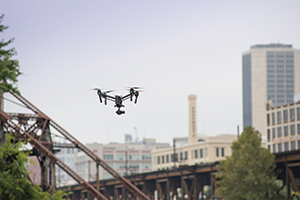 Earlier this year, the General Assembly passed a law prohibiting localities from passing their own ordinances on drones. “You have federal regulations you have to meet, we right now have basic state regulations for public use, but in the future there will probably be more regulations from the state. But if you add in local, you’re asking a company to come in and comply with three different sets of rules, and that’s difficult for a business to do,” says Cushing. 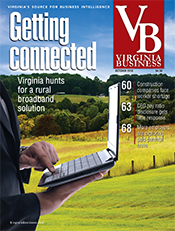 In addition to privacy issues, the industry must grapple with cyber threats and the potential misuse of drones —concerns industry advocates say Virginia is well-positioned to address because of its concentration in cybersecurity firms. The new state association also is expected to help the industry engage with a public that’s naturally distrustful of the new technologies. For years, some of the data now being collected by drones has been gathered by satellites and helicopters, Pomfret notes.